New Orleans and a woman in a surgical mask stabs a woman in an alley with a pair of scissors (after asking her if she thought she was pretty. That’s taking fishing for compliments a bit far). A cop in the alley shoots at her – and does nothing. To the Mill! Chas is cooking (something with a lot of greenery. For some reason John never struck me as a salad kind of guy), Zed is trying to induce a vision and John is playing with a Victorian zoetrope which gives Zed a vision of a woman teaching a boy how to shoot – expecting a drunk man to be attacking apparently. Chas checks the map and one of the blood dots are wet – New Orleans. To the crime scene where John’s bling confirms there was a spirit around recently that did the killing. The detective, Jim Corrigan, who was at the crime shows up and is not impressed by John actually introducing them as paranormal investigators – but Zed recognises him; he’s the boy from her vision. Despite his misgivings he seems willing to work with them simply because they have some explanation for how he could shoot someone multiple times and not leave a mark. Skip to a kid hitch-hiking to the city being picked up by a man who clearly has nefarious intentions – and Zed has a vision of the woods, a tree with a damaged trunk and a rushing car. John calls the cop Jimmy to report an accident and we zoom back to the car and the hitch-hiking kid Phillip vanishes from the front seat and reappears in the road looking blood stained and scary – nefarious driver serves off the road and crashes. The gang shows up at the scene the next day. John considers how to go about questioning but Zed is much much better at this. They learn that there’s been several accidents with a hitchhiker in the same location and then Jim shows up to arrest John for knowing about an accident before it happened. He drags John off though john leaves Chas and Zed with instructions before telling Jim that he has two ghostly serial killers. In town Chas detects masked-ghost’s next victim and saves him. She asks Chas if he thinks she’s pretty and Chas says she is – she removes her mask to show some bad scarring and attacks him with shears, leaving him for dead. At the police station, Jim has done some investigating on John’s lead and realised his killer was a dead woman – while John snarkily removes his handcuffs because he can. He’s found Masaki Ross, a model who committed suicide after being slashed and scarred by another model, Tammy who is now out of prison. They also find Phillip the dead hitchhiker. John notes both had been dead years – something has woken these spirits. To Papa Midnite and his followers with lots of dancing and music and Papa Midnite taking money to help the bereaved speak to their loved ones. Using his magic and invoking Papa Legba he gives the woman one last chance to say goodbye to her loved one. Midnite is less than amused by John’s disrespect but he checks just to be sure. He goes to see his most recent client, Madeline Devereaux and is surprised and worried to see she is there with her resurrected deceased husband, Clarke. Papa Midnite doesn’t think it will end well – and she already looks sick. He returns to his car to find that John has escaped and shoved his driver in the boot, as he does. Midnite says something’s messing with his magic and John puts it down to the often ominously referenced “rising darkness”. Midnite wants John’s help and in exchange Midnite erases the grudge between them – and agrees to let John speak to Midnite’s sister. Meanwhile Jimmy finds Zed on the road making sure no more hitchhikers fall into Phillip’s trap – and he suggests that they pick up the hitchhiker instead – they do (after talking and Jimmy revealing he knows Zed’s past). They pick up Phillip and Zed tries to talk to him – but he vanishes and does his appearing in the road trick – Zed accelerates and drives right through him. John is piling up the bodies ready for magical burning in Midnite’s space while talking to Zed about her ongoing efforts. They raise the clue that all of the grieving people feel guilty about the deaths (but don’t really run with this major clue). Together, John and Midnite have a big shouty ritual – and it doesn’t work. The bodies aren’t even warm. They argue and each blame the other. As they arguing escalates and they both hit each other and throw terrible accusations, John has a revelation on that whole guilt clue. They bring in the grieving and tell them they basically messed up Midnite’s spell by keeping the dead alive with their own guilt and inability to forgive themselves. With their consent and help, the ritual works, Midnite is overwhelmed by the loa, the bodies burn and the ghosts disappear. Jimmy, disturbed, sneaks out during the ceremony but he and Zed have a talk. Jimmy destroys Zed’s missing persons file for her. And Zed has a vision of Jimmy being rather horribly mangled. 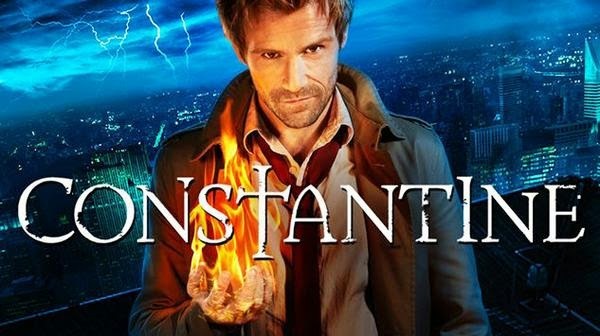 Constantine and Midnite continue their uneasy truce and debate – Midnite offers a chance to speak to John’s mother but he declines – he wants to know more about the Rising Darkness, speaking to his sister (or her skull) which basically says the darkness is coming, heralded by someone close to John who will betray him. I would quite like to see the debate between Midnite and John develop – experts in their field vs John’s very generalist – and very sloppy – approach. At very least it suggests that John could get a handle on anything, but may need to call in expert, specialised knowledge. It’s an interesting dynamic to develop. I also really like Midnite’s accusation that John is a “magpie” of tradition, who steals from other cultures without the tradition behind it. And I like the idea of Midnite being more regular and fleshed out – especially since the not-exactly-moral-but-still-has-standards morality Midnite is isn’t a thousand miles from John’s own. He doesn’t have to be a saint because this is clearly a world where saints probably end up victims, it’s too dark and gritty for that. I also like that Midnite’s immortality or grey-mortality is not linked to his voodoo which is different from his past portrayal. He’s a dubious moral character who practices voodoo, not a man practicing dubious magic. I like Zed, she’s an interesting character, she’s skilled, she’s clever, she’s crafty – but she’s terribly underused. At best, she is John’s sidekick and she could really be so much more.